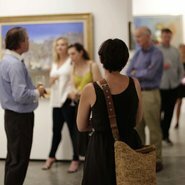 Join us for a special preview at two of Sydney’s leading auction houses – Sotheby’s and Deutscher and Hackett. Damian Hackett, Executive Director of Deutscher and Hackett, and Sotheby’s chairman Geoffrey Smith will share their extensive knowledge on the secondary art market, plus tell you everything you need to know about collecting and buying art from an auction house. Be one of the first to view significant artworks included in two Important Australian and international art auctions – a rare treat! A light lunch at a local cafe is included.